About one in eight women will develop breast cancer in their lifetime and in 2011, there were more than 2.6 million breast cancer survivors in the U.S. Contrary to popular belief, only 5-10% of breast cancer diagnoses are associated with a family history of the disease, 15-20% of breast cancers are linked to lifestyle factors, leaving over 70% of breast cancers largely unexplained. For many years it was believed that the risks of harmful chemicals were directly proportional to the amount of exposure. But scientists now know that the timing, duration and pattern of exposure are at least as important as the dose. Exposure to environmental toxins during critical windows of susceptibility (puberty, pregnancy, lactation, and menopause) may increase the likelihood of a breast cancer developing. According to the Massachusetts Breast Cancer Coalition, of the 85,000 synthetic chemicals introduced into the environment, only 7% have been tested for effects on human health and only a handful of substances have been banned by The Safe Chemicals Act. Our research focuses on the Silent Spring Institute’s 216 mammary carcinogens (cancer-causing chemicals) and The Endocrine Disruptors Exchange’s list of 870 potential endocrine disruptors. 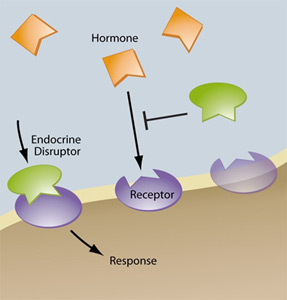 An endocrine disruptor can be defined in many ways, but The Endocrine Society defines it as an exogenous chemical or mixture of chemicals that interferes with any aspect of hormone action. The endocrine system is responsible for many of the body’s primary functions. Hormones are substances released into the bloodstream to target a particular tissue or receptor to generate a response. Hormones regulate various human functions including growth, metabolism, and neurological development. When endocrine disruptors affect the body’s receptors, any of these functions can be disturbed or interrupted. These effects can be irreversible. Some of the synthetic chemicals that exist in our industrialized world are found to be endocrine disruptors. Outside chemicals can mimic natural hormones in appearance and shape, resulting in the body’s receptors, to allow these substances to attach and interrupt the functions that maintain homeostasis (Fig. 1). This interruption can result in complex effects, not all of which are known, but have been related by many to increases in various human diseases. Many of these chemicals are persistent, meaning that they will remain in the body’s system and resist decay. Not all chemicals possess this quality, but that does not mean that they are not a risk. It was recently published by Tom Zoeller, POB science advisor, that the effect an exogenous substance has on the body is directly correlated to the timing, not the dose, disproving that the “dose makes the poison”. It is in the developmental stages that human bodies are most vulnerable, and effects can carry on to other stages of life. This discovery has brought to light that humans exist in an environment with many different risks. From years of chemical use, our earth has hormone-disrupting chemicals in the air, soil and grass. We cannot control some of these exposures, thus we need to make sure that we take control of the exposures of which we do have a choice in every day.